Historical photo from our archives. 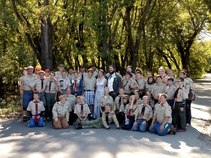 Wooden tables (4x8) and benches were built for the Boy Scouts. Tables and benches from early years are in use in the office and interpretive center. 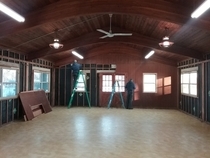 Dining hall is under remodel. Ash trees from the park were sent to the lumber mill & are being installed this winter as well as LED lighting. Facebook & Twitter show progress. Photo above is sneak preview of installation efforts! The view from Hok-Si-La Park dining hall of the beach and the Wisconsin Bluffs is spectacular. The dining hall is perfect for elegant or causal events; family reunions, graduation parties, company picnics, weddings, birthday parties, confirmations and school programs. The park hall seats 60 - 200 people depending on area rented. Caterers enjoy the large kitchen or if feeling creative cook up a feast for your guest. The kitchen contains a walk in cooler, refrigerator, gas stove (new stove installed spring of 2017). 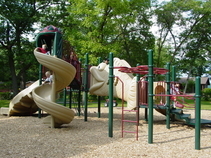 Two parking lots provide ample parking for your family reunion or birthday party. The Boy Scouts of America built the dining hall above the shores of Lake Pepin in 1956. The hall is located near park amenities: a sand volleyball court, basketball court, swimming beach, horseshoe pits, playground, restrooms, chapel and hiking trails. -Weekday dining hall rental is available at discounted rate.